Sometimes I just want hummus. And fresh bread. And sometimes, just sometimes, I have time to make both. I’m just lazy, and while dried chickpeas are 800x cheaper than canned, and more sustainable (less packaging), I always forget to soak them overnight. But this time I remembered! The past few Vegetable Husband boxes have had super cute bunches of small carrots, and remembering SusanV’s awesome looking carrot hummus, I knew I wanted to make it. But hummus requires bread! D&T posted this recipe for honey oat bread awhile ago and it had me drooling. So, doing what I do best, I snagged the recipes from these talented people’s blogs and whipped up a time-intensive but oh-so-worth it snack. The poet prefers his hummus to be super garlicy and olive oily, but with the carrot version I wanted to go clean and cool. I didn’t add any oil, just water, and I didn’t add any tahini or spices. Personally, I love the taste. Clean, carroty, and very light and fluffy. I added more water than Susan called for, but it was bit by bit, so I don’t know the total amount. I think that would depend on how watery your carrots are. Speaking of the poet, he offered to take me to The Hostel In the Forest’s Food, Farming, and Nutritional Healing Retreat in March for my birthday! I’m so stoked–the workshops include vegan cooking, gluten-free baking (something I’ve always wanted to dabble in), fermentation, bread-making, urban gardening, composting, and etc. Too much goodness in one weekend! We’re staying in the “Turtle Room” because the tree houses are full, but how cute is that name? We’re actually going to spend March 1-3 down there too for Spring break, so I’ll have a recap of those days before the retreat. How I love good people, good food, and forests! Boil your oatberries until they have absorbed all of the water they’re going to. Be careful, as they’ll boil over if covered. You could steam them, if you had a steamer, in which case reduce the amount of water to 2 cups and steam for 45 minutes. After the oatberries have cooked, remove from heat and let cool while you’re proofing your yeast. Heat 1 cup of your water until nearly boiling, add 2 cups of cool / room-temperature water, and mix in sugar and yeast. Let this stand until yeast gets nice and bubbly (around 10 minutes or so). Combine oatberries, yeast ferment, agave, flax seeds, oat bran, and vanilla. Mix thoroughly, then add in enough flour to get a good dough going, mixing with a spatula until you are able to knead it. Knead until you feel like your arms will fall off or until the dough won’t easily absorb any more flour. Set aside in a reasonably warm place until more than doubled in size (about 2 hours). Gently knead for a minute or so, just to distribute the yeast again (it’s been sitting in there, eating, and is probably close to starving by now, and may have reproduced; it doesn’t have any legs, either, so you have to take it to the food). Separate into 3 equal sized balls. Form into loaves (I only formed one loaf in a bread pan, the other 2/3 of the dough I formed into a free-form loaf on a baking sheet). Oil your pans well. Place loaves into pan. Liberally sprinkle the rolled oats over the tops, and then … perform something of the sort of action one usually performs with an omlette, tossing the loaf pan about so that the bread rotates through the oats. Let rise until more than doubled in size (1 hour). Bake at 300F until internal temperature tests to greater than 195F (or until you think it’s done). Remove to wire racks immediately and let cool thoroughly before slicing. On the stove or in the microwave, cook the carrots in the water, covered, until the carrots are just tender. Put the carrots, water, and garlic into the food processor and puree. oooh my birthday is in March, too! The 16th. That retreat sounds rad!! Both the bread and carrot hummus look great! The combination of fresh bread and hummus is always scrumptious. The retreat looks fantastic! I’ll be in Georgia this summer, so maybe I should see if I can get a reservation there! That retreat sounds so cool – can’t wait to hear all about it! 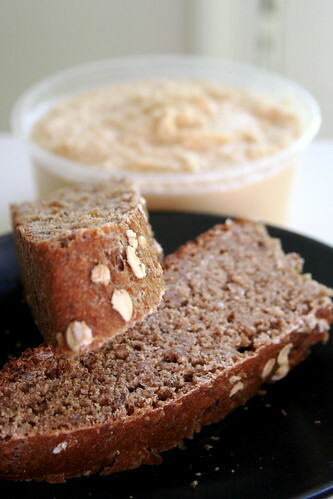 And I just made banana/agave oat bread last night – I was sucré to your salé! amazing treats. bread sounds delish. and i love that you can make “hummus” out of almost anything! awesome w/ carrots i’m sure. What an awesome birthday present! Can’t wait to see pictures and hear all about it in March! Oat bread is my absolute favourite! Thank you for posting the recipe, I’ll get back to this for sure. Your recipe for the carrot hummus calls for pre-soaked chickpeas. This sounds like you didn’t cook them? Thanks for reminding me to pull out some garbanzos! And … can you believe that we can’t seem to find whole oats in this country? We’re having to use boiled wheat-berries, now! This combination sounds soooooo good! Your birthday sounds like it’s going to be a lot of fun! i think the carrot hummus sounds perfect – no oil, no tahini – just letting all that carrot yumminess shine through! mmmmmm! totally going to have to try the agave oat bread – i just need to find some oatberries. hmmmmmmm…. the retreat sounds so freak’n cool! i too have wanted to try out a little gluten-free baking – take notes & share! yay! The healing retreat sounds fabulous! I’d be most interested in the urban gardening workshop, it would be awesome to have a small garden. Your bread and hummus look so yummy! Hey, you’re a Pisces too! Okay, so I love this so much I am linking to you. Let me know if I need to change anything!